There are more than 3,000 universities in the United States alone. Which, as college admissions professionals know, makes it challenging to break through all the noise. 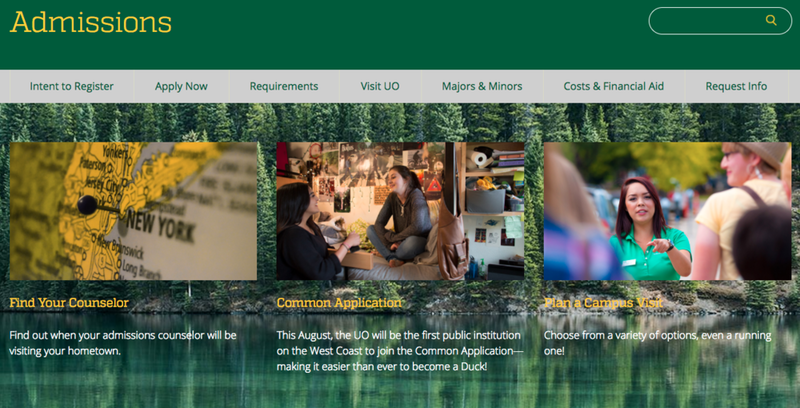 These nineteen colleges stood out to us with their data-driven, innovative, and sometimes wild strategies to create memorable and effective admissions pages. Where the grass is greener: One look at the Johns Hopkins University landing page, and there’s no question how it snagged the top spot on our list. This site is big and bold, and it does an incredible job of showing what campus truly “feels” like. With hero videos so real you can smell the grass through your computer screen (please don’t actually try it). Videos like these can increase conversions by 144%. Not surprisingly, John Hopkins University won the 2016 school/university webby award. Virtual Reality Stars: “We’ve all come here to change the course of history…” Wow, this site is inspiring. Makes us want to start working out at 5 am. GWU developed a virtual tour that shows how the university actually fits into the surrounding DC community. It shows students what life beyond the university looks like and eases concerns that city living overwhelms the classic college experience. Virtual tours are a hot trend and can generate 46% more conversions than still images alone. 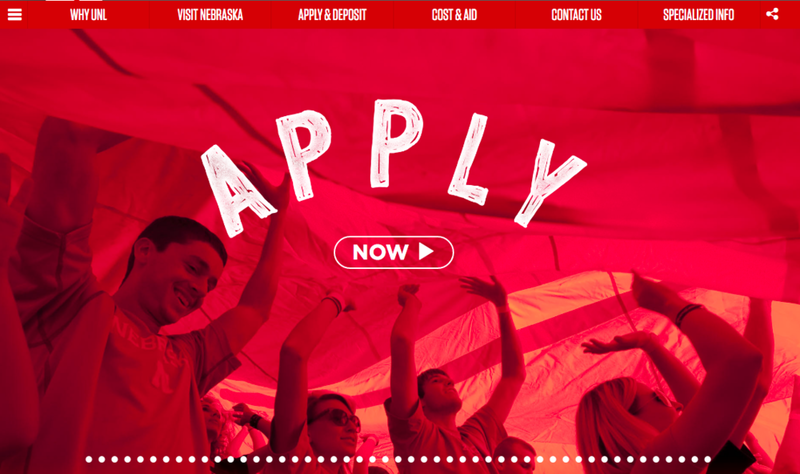 Re-inventing the application: The University of Nebraska turns the application process into an “applica-fun” process (incredibly cheesy, but you get the point). The simplicity of replacing the “apply here” button with a “play” button transforms the application into an experience. From the landing page, future Huskers are prompted to create an account instead of start a scary college application. This request resembles that of social media and e-commerce pages, processes these students are already familiar with. Minimalism to the max: You can never go wrong with the perfect blend of visuals and simple navigation. 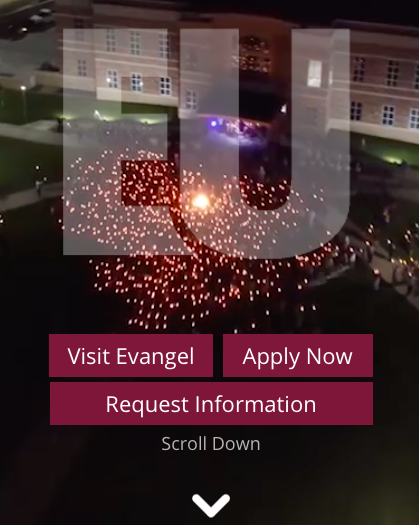 Evangel University nails this combo and streamlines the applicant’s user experience by providing video and call to actions: “apply”, “visit” and “request information,” right on the landing page. See. Apply. Done. The call to action is so clear — if it were any clearer you might run into it. 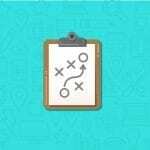 Studies show that having a standout call to action can increase conversions up to 105%. The Innovators: 94% of a user’s first impressions are design-related. Eye-catching and innovative, the Columbus College of Art and Design’s site lives up to all expectations. Visitors are immediately immersed in interactive applications that feature designs of CCAD’s talented student base. Sending a message: Hampshire College is on our list because they complement their bold imagery with bold language: Learn, Live, Lead, Apply. Their language is relatable and uplifting to create a strong tone of achievement. It’s clear Hampshire College is encouraging prospective students to take action and reinforcing the importance of experience. One of our favorite parts of their homepage is the “VISIT HAMPSHIRE” button (below) that encourages students to step past the website and into an experience. The language is pure mastery. Know Your Location: Western Washington University is a beautiful campus in a beautiful location, and everyone who visits their website knows it. This site made our list for an artistic incorporation of the university’s natural surroundings into its web design. Nestled against an evergreen hillside with panoramic views over Bellingham bay, WWU is consistently ranked one of America’s most jaw-dropping campuses … a great selling point. Western Washington is infamously known for its rainy days, which could come as a deterrent to students, especially those from out of state. By showing videos and images of how beautiful the rain can be (and that sunny days do exist), WWU addresses a pain point, which can increase conversions by 32%. Become a Color Psychologist: Did you know younger audiences tend to prefer bright colors like yellow, red and orange while older audiences are more drawn to calm blues, greens and purples? The University of Maryland’s colors just so happen to be red and yellow, which makes them a winner amongst millennials. GeoFli tip: Beware of brown, orange, yellow and purple for web design. They are consistently ranked as people’s least favorite colors. Communicate your purpose: This site stood out to us for its clear focus: giving back and experiential learning. 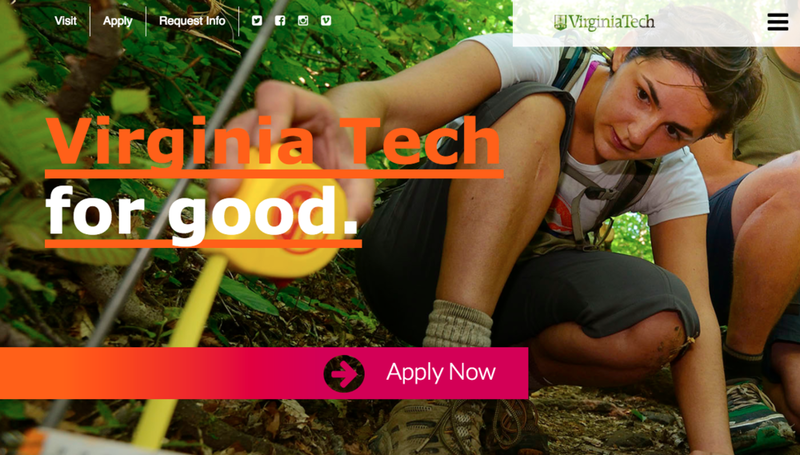 The landing message, “Virginia Tech for good” appeals to the sense of authenticity and social responsibility that millennials crave. The layout is simple to digest and naturally rolls through students’ thought process: from scheduling a visit all the way down to the nitty-gritty of financial planning. Virginia Tech’s long scroll design focuses on the student’s journey and tells a cohesive story. Show-off your students: This site invites users to discover their “path” with an interactive, roll-over slider that highlights real student stories and their selection of programs. RMCAD has a wide variety of program offerings and this uniquely designed slider puts all drop down menus to shame. With so much content already available on the web, it’s natural for consumers to sometimes ignore your content (even if they don’t mean to). 700,000 Google searches are performed every minute. Therefore, you need to create content that engages the audience. A good way of grabbing their eyeballs is to convey your message in the form of stories. The Instagram Pros: The fun geometric design of the Bates College website is so interesting to look at, you can’t help but continue exploring. Perhaps the most important communication of the student experience is the Instagram extension at the bottom of the landing page. These photos show life at Bates College in a raw and accessible way with featured student guest posts. Providing social proof can lead to a 144% improvement on landing pages. Playin’ up the value prop: College in the Caribbean? Sign us up! “Your Journey” at the American University of the Caribbean School of Medicine begins with a scrolling storybook design that reveals a new page of AUC experience as you scroll through. The content blocks are simple to digest and nothing beats those beautiful island photos. This site does a great job of illustrating the school’s compelling value proposition by utilizing people and location. Images of people on your landing page has a huge impact on conversions. Media Mavens: Chill, hip and relatable — just like Colorado. 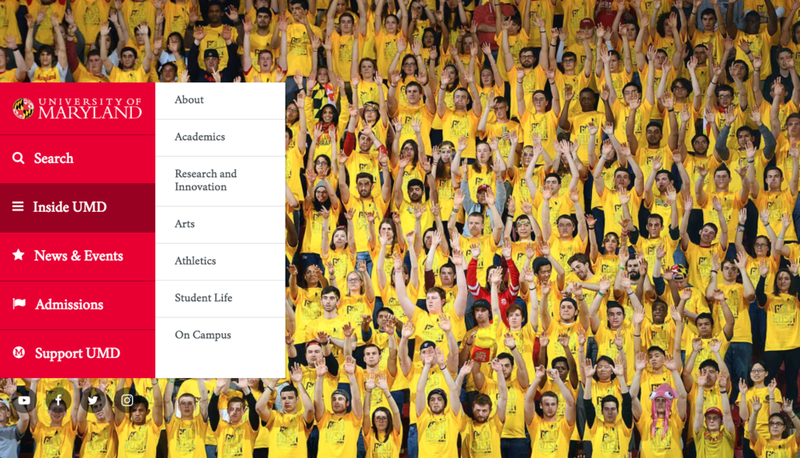 The Undergraduate Admissions page looks like an indie videographer’s blog on steroids. It’s hard to do video as well as CSU (and they know it). 66% of consumers would rather watch a video on a topic than read an article about it, which makes video a powerful tool when you’re providing a glimpse of campus atmosphere to a student that lives too far away to tour. For the Gator Good: This website is a blast and makes us want to save our pennies for a Florida vacation. Bold, orange and blue fonts lay out words of inspiration: “Where will you go from the top?” and, “Your best is just the beginning.” Whoever designed this site should direct the next Gatorade ad (pun intended). Natural language like this has been shown to increase conversions by up to 40%. It’s not easy being green. 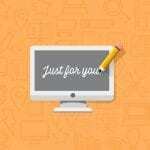 Green lawns, green trees and … a green website! The University of Oregon’s dedication to their school colors runs deep. That’s why they’ve integrated natural green textures into their backgrounds and design scheme. The psychology of color has a surprisingly large impact on how people interact with your website. Most obviously, green is associated with nature, but the color has also been proven to promote creativity and is most likely to be retained by the viewer. You’ll see many clickthrough buttons are green for this reason. There’s no question this school is 100% PNW (Pacific Northwest) proud. Know your audience: The Washington State University admissions site surprised us with its fresh fonts and social media tile design. Social media is interactive by nature. WSU switches it up from the popular scrolling blocks and simplifies the user experience with highlight-able tile graphics. These tiles can be found all over their site and blend concrete numbers with thought-provoking images, sure to resinate with both the analytical and artistic types. Simplicity, simplicity, simplicity: The University of Wisconsin knows how to communicate without all the fuss. In a world of pop-up ads and blaring graphics, their clean site layout comes as a relief to the tired eye. White space on a screen gives the viewer a break, and is an important part of minimalist design. The landing page immediately funnels the user into a more streamlined experience based on their stage in the application process. No funny business here. Click “visit” and you’re taken to a personalized page to learn more and schedule a tour. Click “apply” and you’re taken to the admissions checklist. This site is simple and intuitive. Well done, Wisconsin. 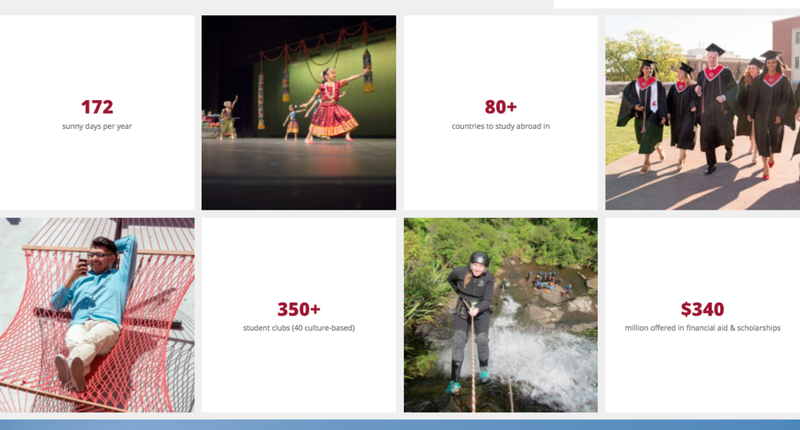 Make it look good: What we love most about MSU’s admissions page are the graphics. Seriously. Go check them out. 38% of people will leave a site if the layout is unattractive, so strong graphic design is well worth the effort. 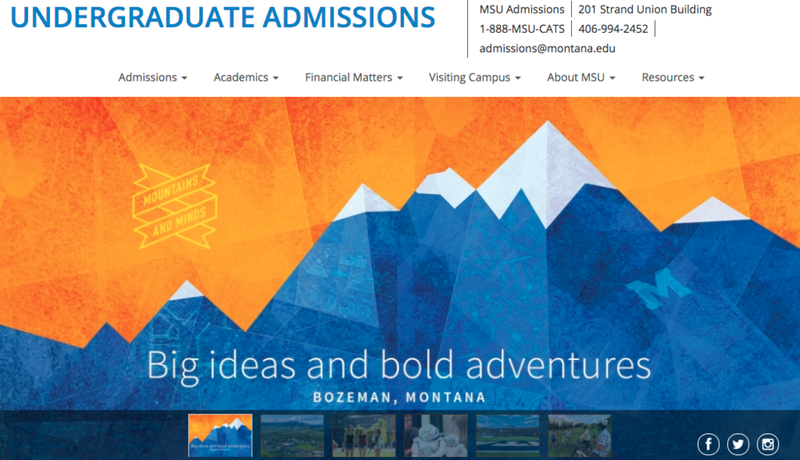 MSU’s mantra is “Mountain and Minds,” and every aspect of their site reflects this. “Big ideas and bold adventures”. The landing page is a one-stop-shop for social media, student experiences and the case for why Bozeman is one of the best cities in America. We’re sold. Make it feel like home: Purple, tigers and orange — Oh my! 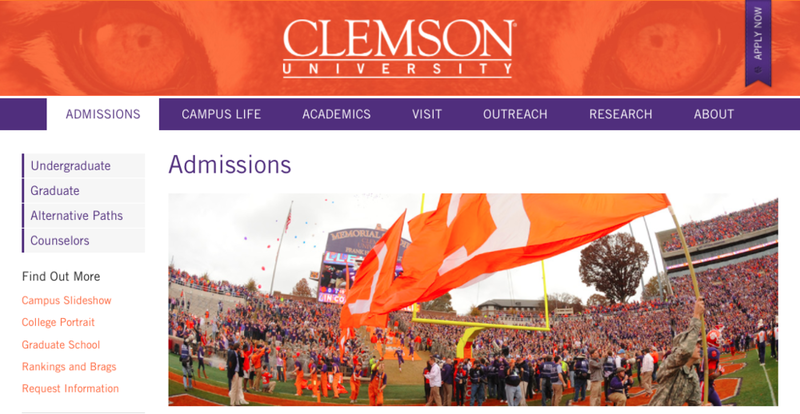 Everything about the Clemson admissions site bleeds school spirit. We love this site because it promotes feelings of community and togetherness with big “Gameday graphics,” and a purple and orange color scheme. Many of the photos on the page show students being active. These photos actually increase Clemson’s favorability. According to this Cornell study, photos of people’s faces (especially those that achieve eye contact) actually increase viewer favorability of the brand. Those tiger eyes in the header do more than just “look cool”. GeoFli allows anyone to easily change and replace website content based on visitor location. We work with colleges like the University of Oregon, Colorado State and many others. Interested in testing GeoFli today? Start a free 14 day trial here! Have other questions about our admissions focused website personalization, managed digital marketing services or potential partnerships: complete the form below.